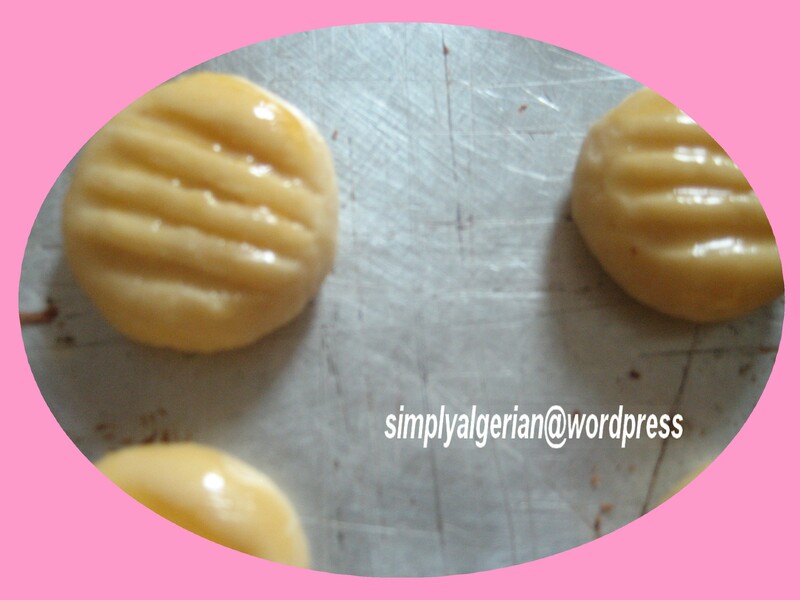 I love cookies and know that lots of my faithful readers visit my french blog (click ) in search for new biscuit ideas. 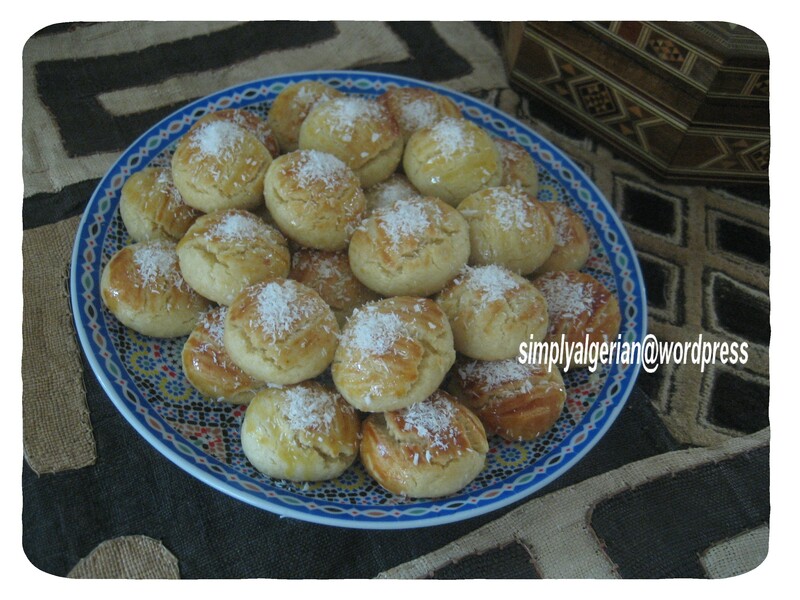 While the traditional Algerian cookies can be quite dunting and time consuming as they require lots of decorations, I always try to make simple and delicious ones and leave the elaborate versions for eids and other special occasions. I tried it the next day and thanks God, it turned out to be a hit among my children . the only drawback is that it doesn’t give you a big amount so next time, I might double the ingredients and also reduce the amount of the baking powder . I find the biscuits were too crackled for my taste. Otherwise , they were delicious and soft, the syrup adds another dimension to the cookies by keeping them moist and very soft. 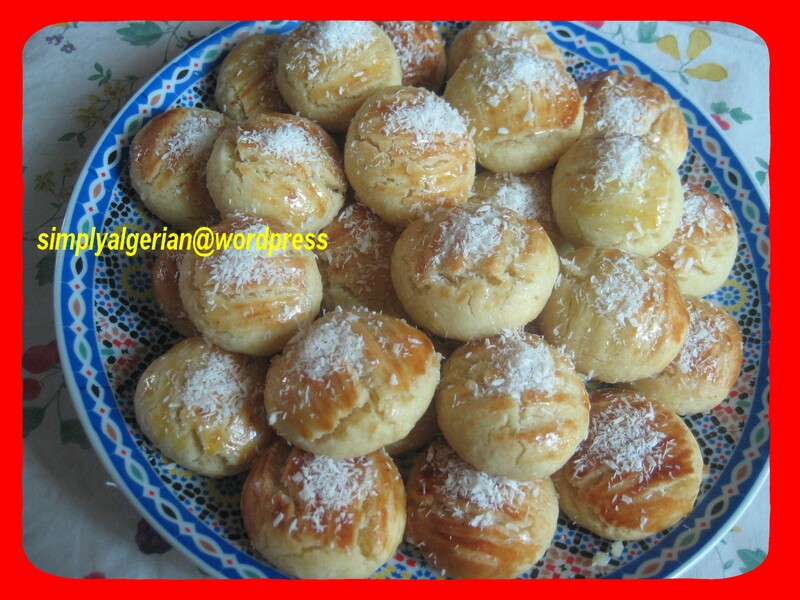 Feel free to try the recipe at home during eid adha or for the coming pilgrims, if any.. Using electric beaters whisk eggs, sugar, vanilla together, add in butter, coconut, flour and baking powder. beat until all ingredients are just combined and form a soft dough. refrigerate for 30 to 45 mn. preheat oven to moderate 180 degrees. line biscuit trays with baking paper. remove the dough from the fridge, roll it into small balls. and slightly flatten them with the back of a fork. brush with the egg yolk and bake for 15 to 20 mn until lightly golden. pour 2 tbsp of syrup on each biscuits, sprinkle with coconut and leave them to cool. Don’t try to soak them in syrup instead, otherwise they’ll become too sweet. enjoy with a hot cup of mint tea. J’ai trouve’ cette recette sur un forum arabe et cela m’a emmidiatement interpele’ d’abord a cause du drole de nom que porte ces biscuits ( roumouch essit voulant dire, les cils de la dame, lol) et par l’ajout du sirop . je l’ai essaye’ le lendemain et Dieu merci, c’etait une totale reussite, les enfants ont bcq aime’. le sirop leur donne une texture douce et tres moelleuse que j’ai beacoup apprecie’. le seul hic c’est que ces ingredients ne donnent pas une tres grande quantite’ de biscuits . je pense donc les doubler la prochaine fois et aussi reduire la quantite’ de la levure chimique. je trouve les biscuits sont un trop crackeles a mon gout. 125 g de beurre ramolli. Sirop : 1 tasse de sucre, 1 tasse d’eau, 2 cas de jus de citron. Travailler les oeufs , le sucre et la vanille, bien battre a l’aide d’un bateur electrique, ajouter le beure ramolli, puis la noix de coco, la farine et la levure. bien amalgamer le tout. mettre la pate au frais pd 30 a 45 mn.